WEST WINDSOR – A Pulitzer Prize winning historian will separate folklore from fact regarding the fabled Underground Railroad during a lecture at Mercer County Community College Oct. 18. 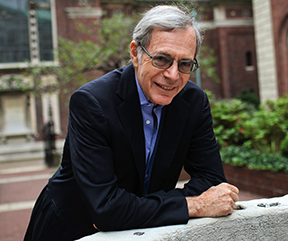 “Gateway to Freedom: The Hidden History of the Underground Railroad” will be the subject of a lecture by Dr. Eric Foner, author of a book by the same name, at noon on Tuesday, Oct. 18 in the Communications Building, Room 109. His talk is part of MCCC’s fall 2016 Distinguished Lecture Series at the West Windsor Campus, 1200 Old Trenton Road. The lecture is free and open to the public. Based on stunning new evidence – including a detailed record of escaped slaves – Foner will focus on New York and the city’s crucial role in bringing fugitive slaves from the upper south through Philadelphia and on to upstate New York, New England, and Canada. He will explain how his research has elevated the Underground Railroad beyond folklore to become part of the historical record. Foner is a DeWitt Clinton Professor of History specializing in the Civil War and reconstruction, slavery, and 19th century America. He is one of only two persons to serve as president of the Organization of American Historians, American Historical Association, and Society of American Historians. He has also been the curator of several museum exhibitions, including the prize-winning “A House Divided: America in the Age of Lincoln” at the Chicago Historical Society. His book, The Fiery Trial: Abraham Lincoln and American Society, won the Pulitzer, Bancroft, and Lincoln Prizes in 2011. Foner received a B.A. from Columbia University, a B.A. first class from Oriel College Oxford University, and a Ph.D. from Columbia University.